Blackburn earned a narrow derby victory over 10-man Preston in Paul Lambert's first game as Rovers manager. The visitors took the lead when Preston goalkeeper Jordan Pickford diverted Hope Akpan's shot into his own net following a goalmouth scramble. Jordan Rhodes fired in from the penalty spot to double the advantage after Paul Huntington brought down Chris Taylor. Joe Garner's left-footed shot gave Preston hope, before Bailey Wright was sent off for a second yellow card. The result leaves Simon Grayson's North End two points clear of the relegation zone, while Blackburn climb to 13th after picking up their first win in three games. Lambert took charge of the visitors for the first time following Gary Bowyer's dismissal on 10 November. And the former Scotland international, back in the dugout for the first time since being sacked by Aston Villa in February, began his reign at Ewood Park in fine style - with a narrow win against one of his new club's local rivals. Preston had the better of the early stages at Deepdale, but struggled to create clear-cut chances, with only Paul Gallagher drawing Rovers keeper Jason Steele into a save. The hosts fell behind when they failed to clear a Rovers free-kick, with Pickford deflecting the ball in after Akpan had poked the ball goalwards from close range. Huntington's misjudged challenge on Taylor allowed Rhodes to score the decisive goal early in the second half, as the Scotland international drilled his penalty into the bottom left-hand corner. Garner pulled one back from inside the box after Stevie May's shot had been blocked, but Wright's late dismissal for picking up two yellow cards in seven minutes ended Preston's hopes of an equaliser. "I think we deserved something. When you look back over the course of the game probably the least we deserved was a point. It was a typical derby match, a lot of tackles and things bobbling around. We felt we had to up the tempo in the second half and we responded really well. "I think we had Blackburn camped in their own half for much of the game and we just needed a little bit of extra quality that we just didn't have. "We were sloppy for the goal giving away the penalty. Garner's goal lifted us, the place got rocking, we were on the front foot but ultimately we couldn't find that equaliser which we deserved. "Overall I thought we defended quite well again but we conceded a freak goal and a penalty so we didn't really look like we were going to concede in open play." "It was strange being back. After nine months out, for the first time in 40 years I was enjoying my life. Then you are back in the hot seat - the highs and lows - but it's great to be back. "We played a terrific game of football. The atmosphere was great in the stadium and we scored two goals against a team that hadn't conceded in six games. The team deserves so much credit for that and I think we looked a threat every time we went forward. "I've asked the players to do a lot for me. We've trained a bit differently, which is no slight on Gary (Bowyer) at all, but I have my own way of training, everyone does, and the players have worked ever so hard to master that and it will take time. "Today is a marker that we can win games. The back four were colossal for us. They were proper men, proper defenders." Match ends, Preston North End 1, Blackburn Rovers 2. Second Half ends, Preston North End 1, Blackburn Rovers 2. Second yellow card to Bailey Wright (Preston North End) for a bad foul. Bangaly-Fodé Koita (Blackburn Rovers) wins a free kick in the defensive half. Attempt blocked. Greg Cunningham (Preston North End) left footed shot from outside the box is blocked. Attempt saved. Danny Guthrie (Blackburn Rovers) right footed shot from the right side of the box is saved in the bottom right corner. Assisted by Corry Evans. Bangaly-Fodé Koita (Blackburn Rovers) is shown the yellow card. Offside, Blackburn Rovers. Ben Marshall tries a through ball, but Bangaly-Fodé Koita is caught offside. Corner, Preston North End. Conceded by Grant Hanley. Substitution, Blackburn Rovers. Bangaly-Fodé Koita replaces Jordan Rhodes. Hand ball by Danny Guthrie (Blackburn Rovers). Corner, Preston North End. Conceded by Markus Olsson. Attempt missed. Markus Olsson (Blackburn Rovers) right footed shot from outside the box is just a bit too high. Substitution, Blackburn Rovers. Danny Guthrie replaces Craig Conway. Attempt blocked. Ben Marshall (Blackburn Rovers) left footed shot from the right side of the box is blocked. Assisted by Jordan Rhodes. Attempt blocked. 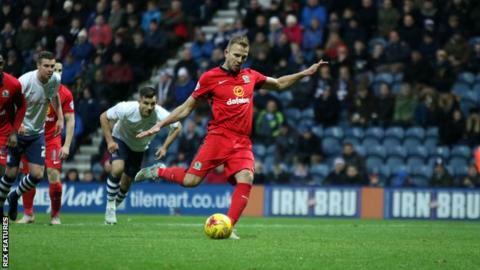 Jordan Rhodes (Blackburn Rovers) right footed shot from outside the box is blocked. Assisted by Chris Taylor. Hand ball by Shane Duffy (Blackburn Rovers). Goal! Preston North End 1, Blackburn Rovers 2. Joe Garner (Preston North End) left footed shot from the centre of the box to the bottom left corner. Assisted by Stevie May. Attempt blocked. Stevie May (Preston North End) right footed shot from outside the box is blocked. Substitution, Preston North End. Stevie May replaces Eoin Doyle. Substitution, Preston North End. Will Keane replaces Daniel Johnson. Offside, Blackburn Rovers. Jason Steele tries a through ball, but Jordan Rhodes is caught offside. Joe Garner (Preston North End) is shown the yellow card for a bad foul.